So, when people today study the ancient Greeks, they are examining not the earliest known humans in the area but later invaders called the Indo-Europeans. This is clear because of the language the Greeks spoke. All extant forms of ancient Greek clearly derive from a common ancestor called Proto-Indo-European, a language which engendered a large number of daughter languages found across much of the Eurasian continent, all the way from India to Norway. These closely related tongues show that the Indo-Europeans must have migrated over thousand of miles in different directions, displacing natives and settling themselves in lands across a wide swath of the Eurasian continent. Another thing we know about the Indo-Europeans is that they tended to enter a region in successive waves. That is, Indo-Europeans rarely migrated into an area just once, and Greece was no exception. As early as 2000 BCE one Indo-European contingent had begun infiltrating the Greek peninsula and by the end of that millennium at least three major discrete migrations of these intruders had surged across various parts of Greece. One racial group of these Indo-Europeans was called the Ionians. They settled along the eastern coast of Greece, in particular the city of Athens, and along the western coast of Asia Minor (modern Turkey). Another group, the Dorians, settled the Peloponnese (the southern part of Greece) and many inland areas. The result was a "dark age" accompanied by massive disruptions in the Greek economy and civilization, including a total loss of literacy. This dark age lasted about three centuries, from 1100 to 800 BCE and, while it seems from our perspective today like a dismal time, it must have been a dynamic and fascinating period in Greek history, perhaps a wonderful time to have lived. The lack of written historical records—the inevitable product of the age's illiteracy—leaves the impression of a vast void but, to judge the period from its outcome, it gave shape to much of the rest of Greek history. Many of the things we associate with Greek culture—for instance, vase-painting, epic poetry, and ship-building—assumed their basic and most familiar forms during this "dark" age. Particularly, many of the Greek myths read and studied today are traceable to this time period. Quite a few are set in the generations just before the dark age or in its early phases. For example, the famous cycle ("collection") of myths about the Trojan War—if, in fact, it is based on any real event in history—must date to some time around 1185 BCE. These myths found their most brilliant expression in the early Greek epicpoems attributed to Homer, ancient Greece's greatest early poet. Homer's first epic, The Iliad, tells the tale of the Greeks' sack of Troy and the anger of their great hero, Achilles. Among other famous characters included there are the beautiful Helen and her hapless Greek husband Menelaus, the king of Sparta. His brother, Agamemnon, the king of neighboring Mycenae who leads the expedition of Greeks to Troy, is married to Helen's sister Clytemnestra with whom he has several children including Electra and Orestes. All later became enduring characters in drama as well as epic. The gods also play a large role in The Iliad, in particular, the king of the gods Zeus, the sun god Apollo, and the goddess of wisdom Athena. Homer's other epic, The Odyssey, narrates the adventures of the Greek hero Odysseus as he wanders around the Mediterranean Sea trying for ten years to get home to Ithaca, an island on the western coast of Greece. Along the way he encounters a number of deities and monsters and much mayhem, but ultimately with the help of his patroness, the goddess Athena, he arrives back in his kingdom safe, if not entirely sound. There encounters his wife Penelope and son Telemachus after an absence of twenty years. These stories convey such a compelling sense of realism about their day and time that more than one scholar has been tempted to see in them history rather than mere myth, but their historicity is questionable at best. One such investigator was Heinrich Schliemann, a nineteenth-century German millionaire and archaeologist, who excavated what is now known as Troy. This site in the northwestern corner of Asia Minor near the straits that separate Asia and Europe indeed contains the ruins of a once-great city that thrived in the middle to late second millennium BCE, but is this site Homer's Troy? 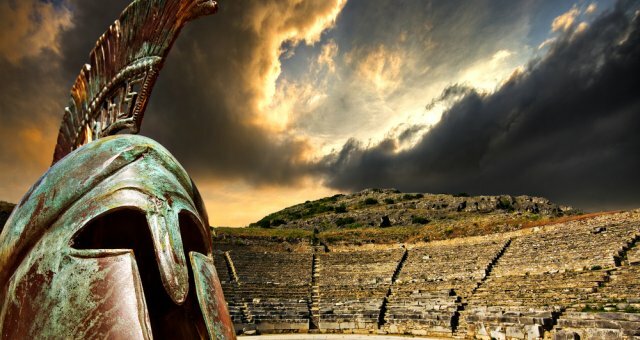 Even if its name was Troy—and there is no firm evidence to that effect—that still leaves open the question of the extent to which Homer's epics preserve historical reality. The debate about the amount of verifiable history preserved in Homeric epic lingers unresolved to this day, a tribute to the enduring, gripping picture of humanity painted by this purportedly blind poet.